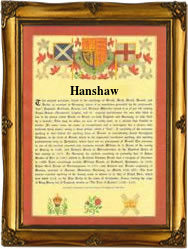 This ancient English locational surname, recorded in the spellings of Henshall, Henshaw, Hanshaw, Hensher, and Hencher, has two possible places of origin. The first is from the village of Henshaw, situated on the River Tyne in the county of Northumberland, the second from a now "lost" hamlet which has been absorbed by the small town of Prestbury in Cheshire. The village names and hence the later surnames, translates from the Old English "hethin-shaghe" as "the wood by the heath". However there is a body of opinion who consider that "Hethin" was a personal name, to give "Hethin's wood". This may well be so, but the meaning is effectively the same, as "Hethin" itself means "The heath". Most pre 7th century personal names owe something to the natural surroundings, because like the later surnames, one of the easiest ways to identify a person, was by their place of residence. What is certain is that there are some very early surname recordings from both counties and these include Richard de Henneshagh of East Cheshire in 1365, Agnes de Henshall in the 1379 Poll Tax Rolls for the city of York, and Edward Henshawe of Henshawe, Cheshire, in 1579. Church recordings include Agnes Hanshawe who married Robert Coldwell on May 1st 1547, at St. Mary le Bow, London, Agnes Henshaw who married Rauffe Crosder on October 30th 1560, at Prestbury, in Cheshire, and Elizabeth, daughter of Ronduphe Henshaw was christened on December 11th 1562, at Gawsworth, Cheshire. John Henshaw, believed to be an Irish famine emigrant, sailed from Liverpool aboard the "John R. Skiddy" bound for New York, on July 1st 1846. The first recorded spelling of the family name is shown to be that of Peter de Henschal, which was dated 1332, in the Subsidy Rolls of the county of Cumberland, during the reign of King Edward 111, known as "the father of the navy", 1327 - 1377. Surnames became necessary when governments introduced personal taxation. In England this was known as Poll Tax. Throughout the centuries, surnames in every country have continued to "develop" often leading to astonishing variants of the original spelling.